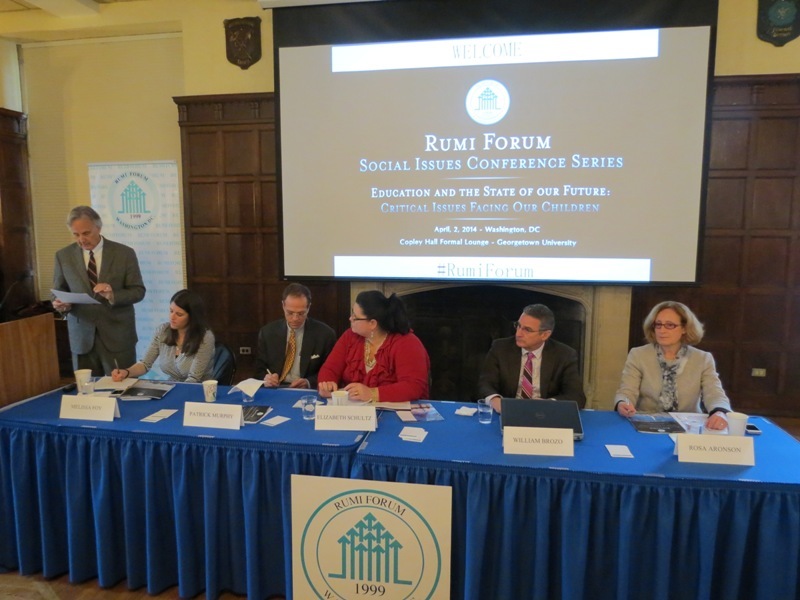 On Wednesday, April 2, 2014, Rumi Forum hosted the conference, “Education and the State of Our Future: Critical Issues Facing Our Children,” as a part of its new annual Social Issues Conference Series. 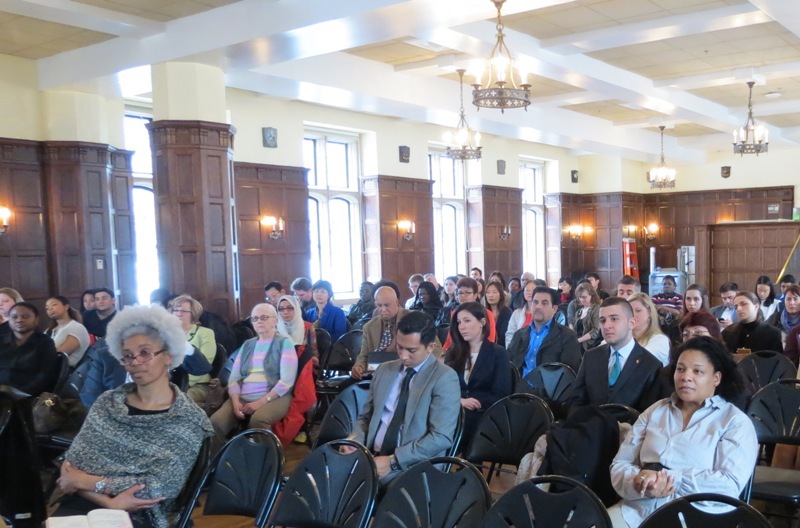 On Wednesday, April 2, 2014, Rumi Forum hosted the conference, “Education and the State of Our Future: Critical Issues Facing Our Children,” as a part of its new annual Social Issues Conference Series. 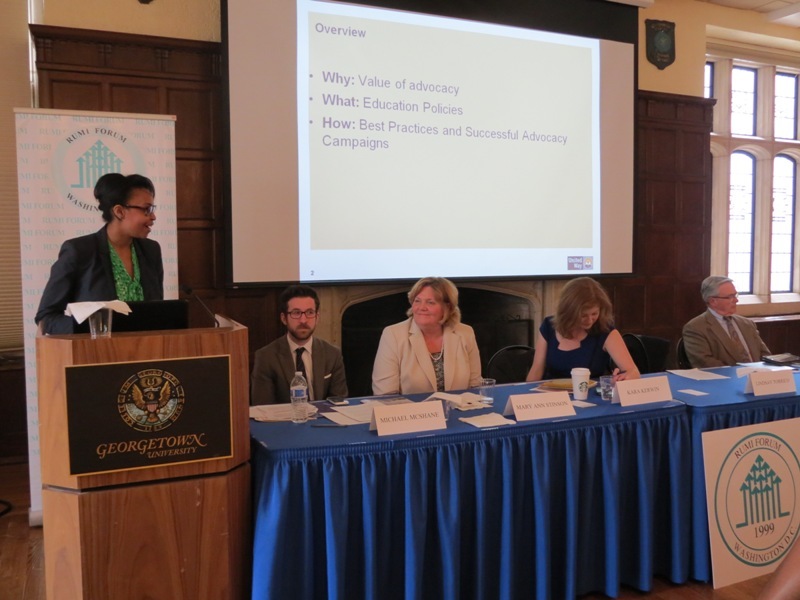 The event was held at Georgetown University’s Copley Formal Lounge and was attended by stakeholders from across the education sector–public schools, colleges, universities and research and non-profit organizations. 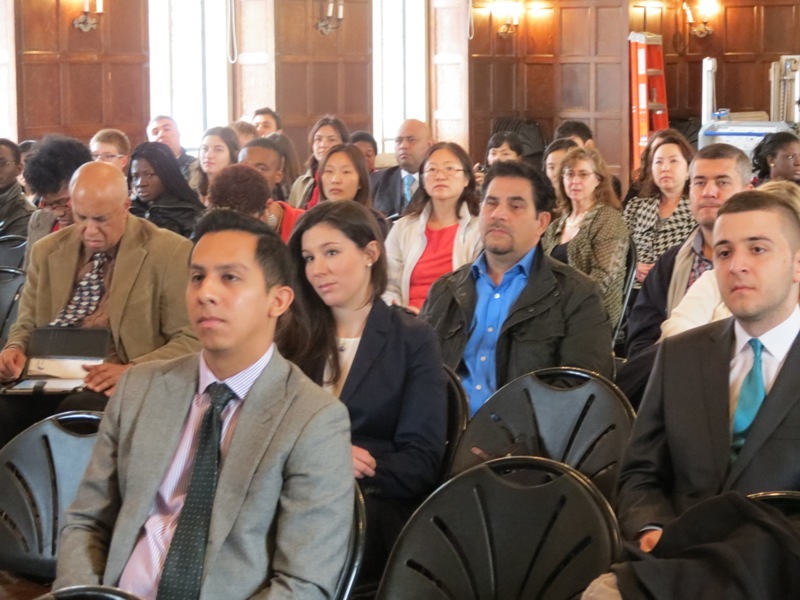 The purpose of this conference was to highlight critical social, pedagogical and civic issues as they relate to the pre-K through 12th grade U.S. educational systems in the 21st century. Specifically, these issues were discussed through analyses of cause and effect, as well as solutions, at both the local and national level. 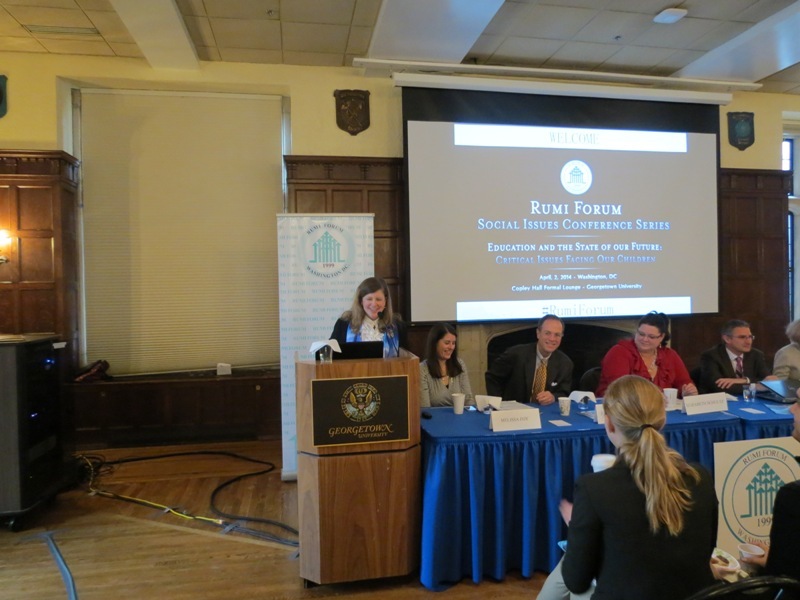 Jena Luedtke, Director of the Center for Interfaith and Intercultural Dialogue at Rumi Forum, emceed the event. 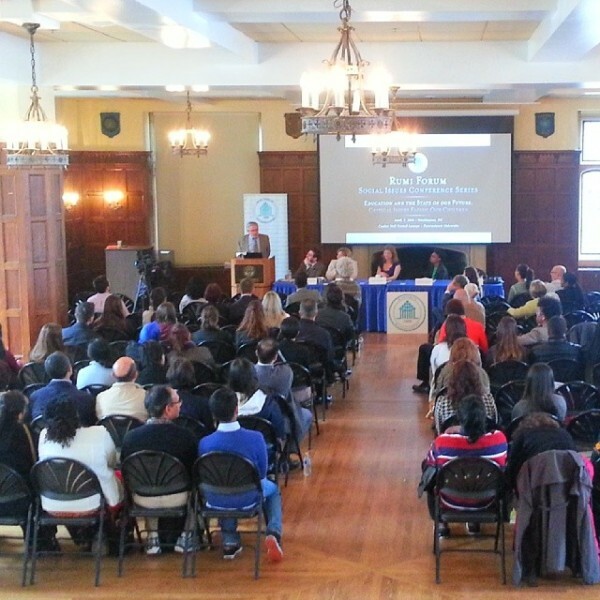 The conference consisted of welcome and opening remarks, three panel sessions and coffee networking breaks. 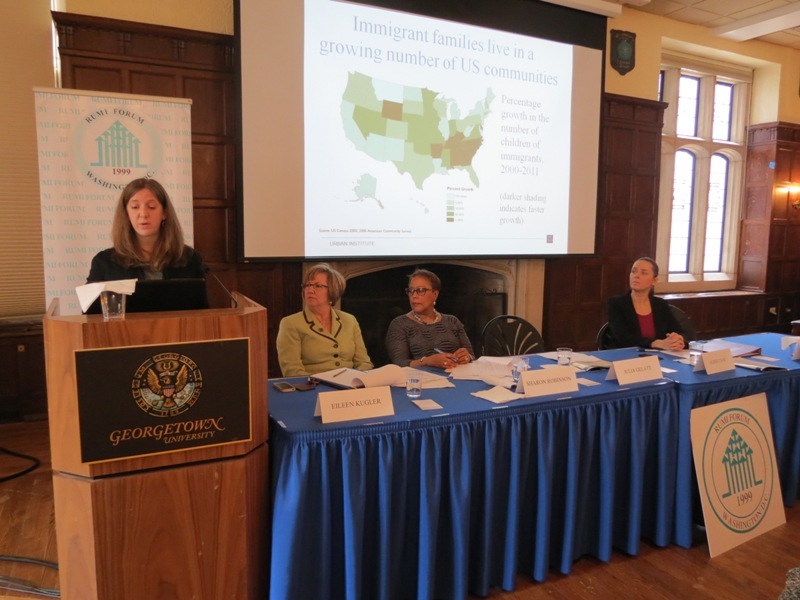 The first panel session, entitled “Addressing the Basic Challenges of U.S. Education System,” was moderated by Melissa Foy, Executive Director of the Georgetown Fellowship Program. Panelists included Elizabeth Schultz, Springfield District Representative of Fairfax County School Board; Dr. Patrick Murphy, Superintendent of Arlington Public Schools; Dr. William Brozo at the Graduate School of Education at George Mason University; and Dr. Rosa Aronson, Executive Director of the TESOL International Association. The second panel session, entitled “Education Reform Efforts and the Path to Educational Success,” was moderated by Dr. Michael McShane, Education Policy Studies Fellow at the American Enterprises Institute. Panelists included Lindsay Torrico, Director of Policy and Advocacy at United Way Worldwide; Kara Kerwin, President of the Center for Education Reform; Mary Ann Stinson, Principal of the Truesdell Education Campus with D.C. Public Schools; Dr. Grace Reid, Principal of the Barnard Elementary School with DC Public Schools, and Dr. Tom Gage, Professor Emeritus at Humboldt State University. The third and final panel session was entitled “School Environment & Teacher Training and Effectiveness” and was moderated by Eileen Kugler, President of the Embrace Diverse Schools. Panelists included Dr. Sharon Robinson, President and CEO of the American Association of Colleges for Teacher Education; Dr. Julia Gelatt, Research Associate at the Urban Institute; Professor Dr. Agnes Cave, Associate Professor of Education at the Catholic University of America; and Dr. Harold Barber, Principal of the Historic Samuel Coleridge-Taylor Elementary School, Baltimore City Public Schools, MD. Within the panel sessions, topics discussed included education advocacy, knowledge exchange, early childhood, social media and technology, student achievement and performance, improving educational outcomes and investment in youth and teachers. SYNOPSIS: This conference aims to highlight critical social, pedagogical and civic issues as they relate to the pre-K to 12 U.S. educational systems in the 21st century. Early education and K-12 areas in America will be discussed, in light of causes, effects and, in particular, solutions, at a local and national level.